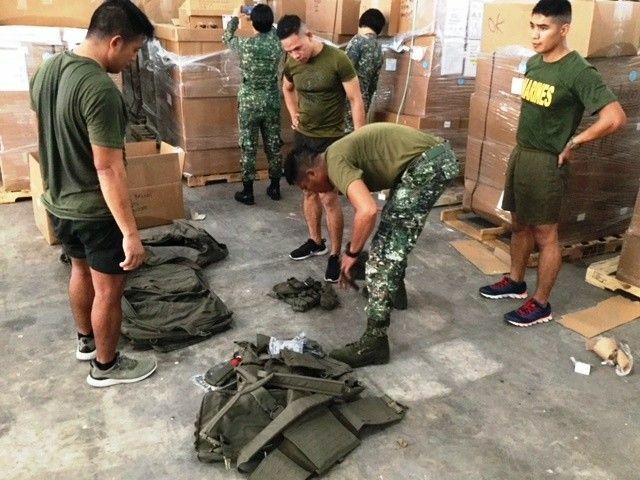 Members of the Philippine Marine Corps conduct inventory of the 525 sets of Personal Protective Equipment provided by the US military. MANILA, Philippines — The US military has provided new equipment worth P178 million to the Philippine marines, which will provide increased protection for their operations. The US turned over 525 sets of ballistic vests, lightweight ballistic plates, tactical ballistic helmets and accessories to the Philippine Marine special operations group (MARSOG) and inshore boat battalion at Fort Bonifacio in Taguig City last May 31, according to the US Embassy. The personal protective equipment were turned over through the Counterterrorism Train and Equip Program. "The recent force protection equipment delivery will fill critical equipment gaps for Marine Operators within MARSOG, a key Counterterrorism and Special Operations unit within the Philippine Marine Corps," the US Embassy said in a release. Having been allies for 70 years, the US has been providing grant assistance and expedited sales of arms and munitions to the Armed Forces of the Philippines. This also assists the Philippine military's modernization goals and urgent counterterrorism and humanitarian assistance and relief requirements.